Forgotten Hollywood » Blog Archive » “Forgotten Hollywood”- Once Again: They are Shooting J.R.
“Forgotten Hollywood”- Once Again: They are Shooting J.R.
Dallas is returning to television. The iconic nighttime soap opera will air in the Summer of 2012 on the TNT network. A new generation of cast members will join Larry Hagman (J.R.), Patrick Duffy (Bobby), and Linda Gray (Sue-Ellen). Ten episodes have been ordered and filming began in October. The production is expected to wrap in January. The location shooting is taking place entirely in Dallas, Texas (of course). 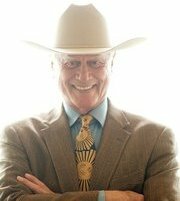 Over the years, Hagman received several Golden Globe and Emmy nominations for playing J.R. Ewing. In October, Hagman announced he was diagnosed with a treatable form of cancer. We can root against J.R., but we wish the versatile actor all the best in his ongoing battle. This entry was posted on Sunday, December 11th, 2011 at 1:02 am	and is filed under Blog by Manny Pacheco. You can follow any comments to this post through the RSS 2.0 feed. Responses are currently closed, but you can trackback from your own site.